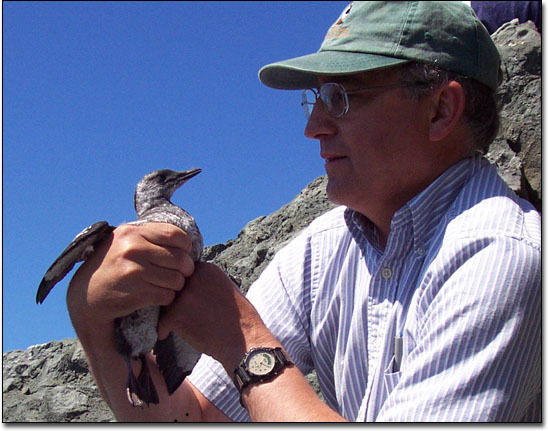 The following is a chronological listing of my 2002 work with the Gannets of the Lobster Bay and the Gannet Rock area of southwest Nova Scotia, Canada. 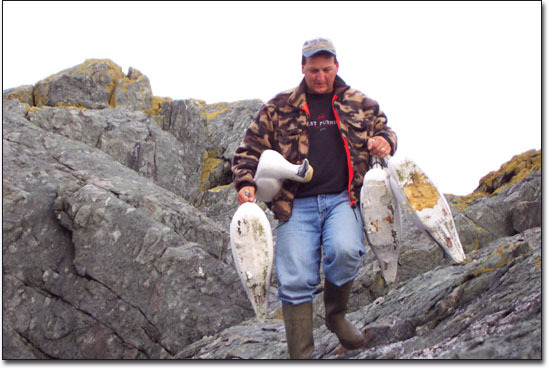 The report also includes Gannet observations from other local residents. Route (in red) taken to go up and down the rock. 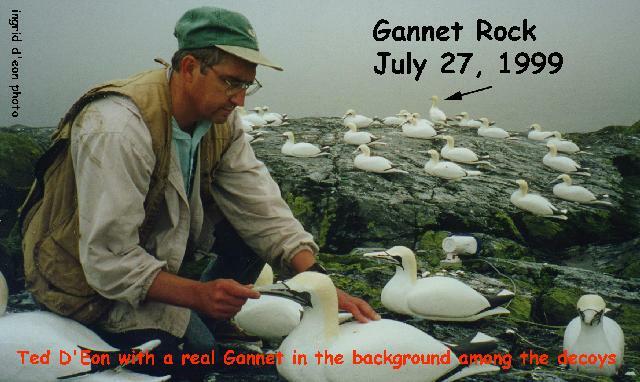 May 18, 2002 - Failed attempt to land on Gannet Rock. The weather had not been suitable to get to Gannet Rock for quite a while. This morning it looked like it might be a possibility. 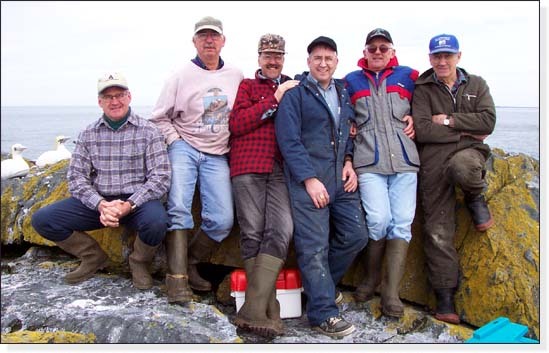 We had no problen getting to the rock and we anchored the Royalsea. Rémi and Alix gave the landing a try with the Zodiac. 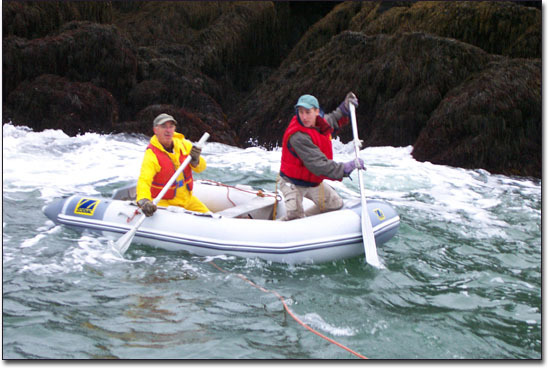 However, there was too much swell, the Zodiac took on water, and we had to abandon the idea for this time. Upon arrival to Gannet Rock, one Peregrine falcon was seen taking off from a ledge. We saw numerous Black Guillemots in the water and on the rock, and one Arctic Tern high above in the air. June 19, 2002 - A beautiful morning. We reached Gannet Rock with no problem. We even saw a few Harbour Porpoises on the way. 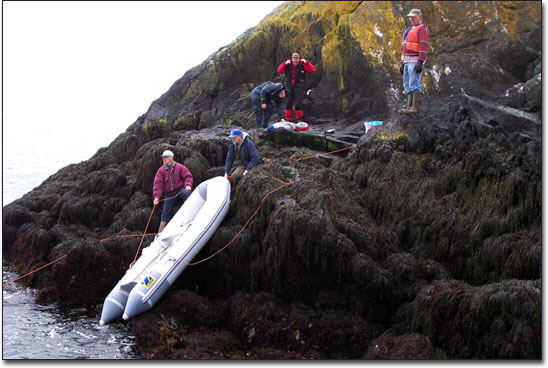 Once on the rock, we replaced the battery for the sound system and it started working again. Some of the decoys had become unglued and were re-attached. 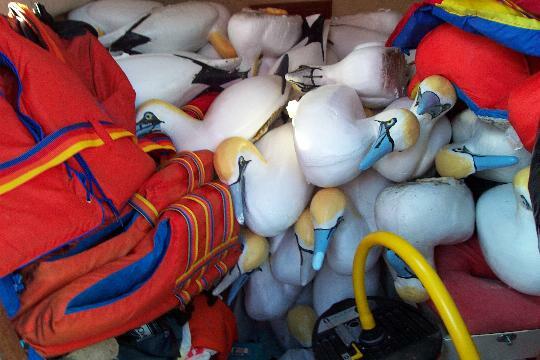 A few of the foam-filled ones had been damaged by pecking and were taken back home for repairs. We found a few Black Guillemot nests containing eggs and there were a couple of Atctic Terns flying above with fish-in-bill, however, no tern nests nor chicks were located. 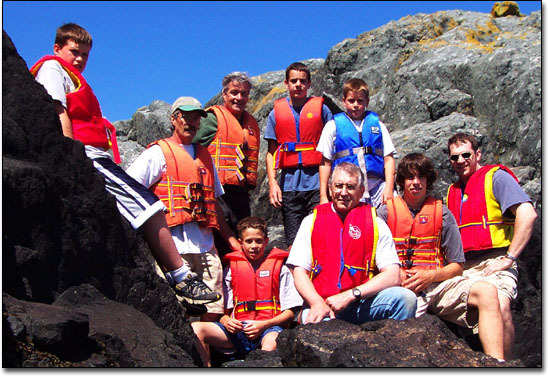 We then continued a few kilometers north to Green Rock (a.k.a. Green Island). Before our arrival there, we passed by a flock of about 50 Sooty Shearwaters. A single Manx Shearwater was with them. A little closer to Green Rock, a single Razorbill circled the boat a few times. 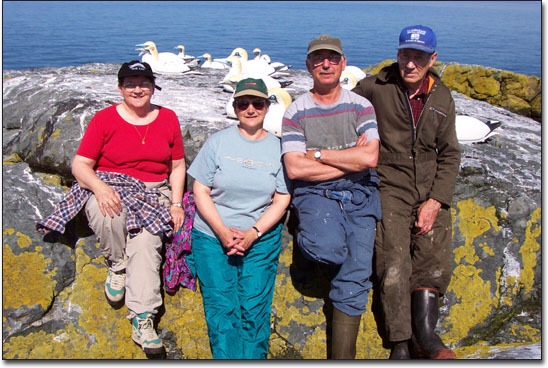 My crew today: Rémi and Israel with Pauline (à Viat) d'Entremont and Dolores-Anne d'Entremont. We had a great boat trip. 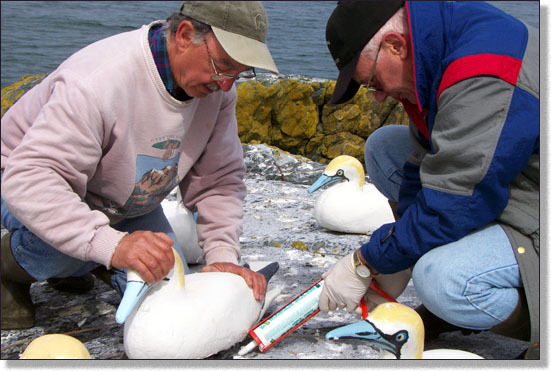 August 1, 2002 - Battery change on Gannet Rock. All went well. Lots of Gray Seals. At least two Black Guillemot chicks in their nesting crevices. Six Arctic Terns were above Gannet Rock. One had a fish in its bill. We could not locate any chicks. October 11, 2002 - THE CROSSROADS HAVE BEEN REACHED! 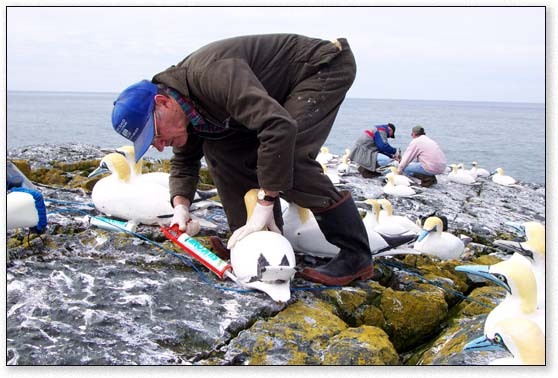 I have decided this is the last time I will remove the Gannet decoys from Gannet Rock. After nine years, the experiment is over. 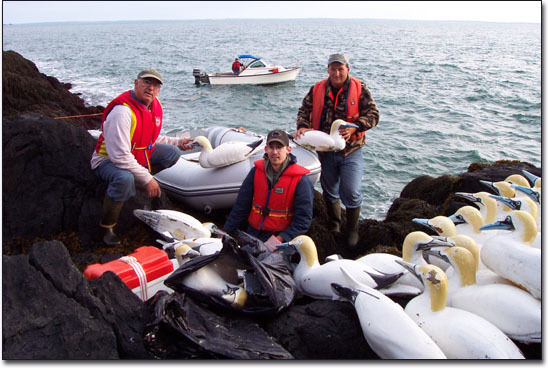 My crew for this historic trip to the Rock for decoy removal were Rémi and Ronny d'Entremont, with Milton and Nigel D'Eon. 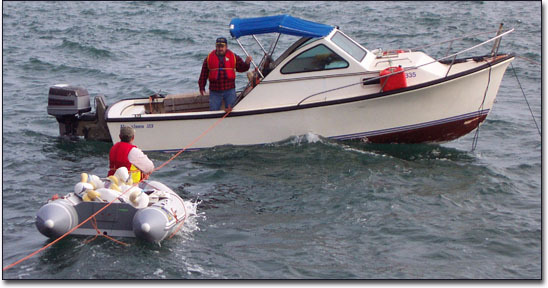 All went well except that I lost one of the boat's anchors. We even saw 7 mature Gannets in the area of Gannet Rock. They were all headed southeast. 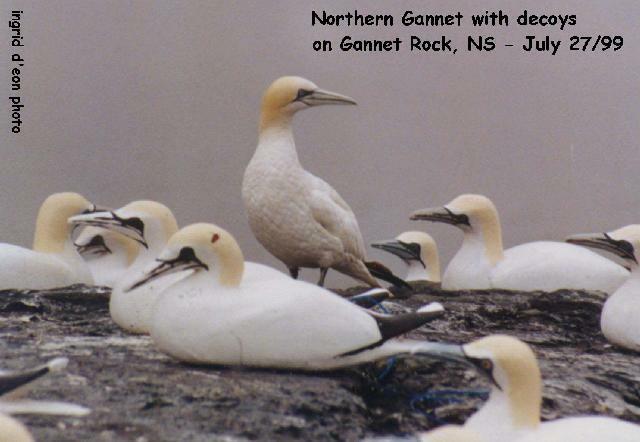 It has been an adventure after adventure, each time I have visited Gannet Rock over the past nine seasons. 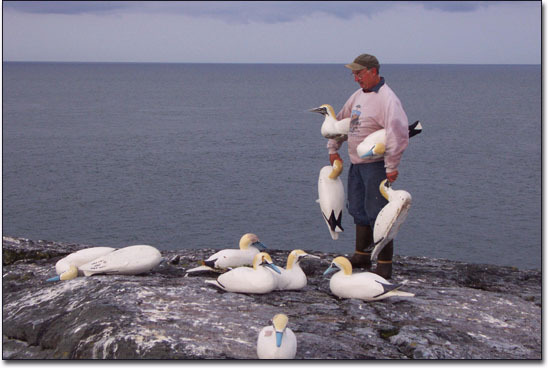 Even though I will no longer be placing decoys there, I expect to keep visiting Gannet Rock several times a year to keep an eye on the goings on out there. It has been a wonderful experiment. And as they say, "You won't know if you don't try". Well, at least I tried. 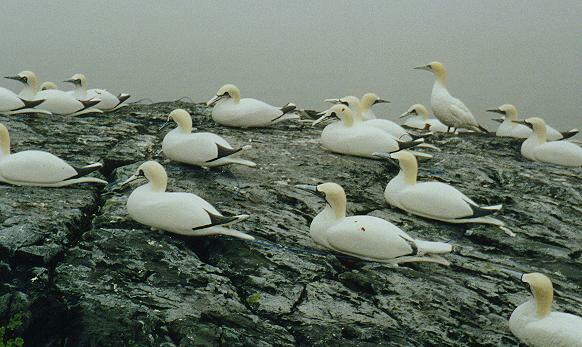 Perhaps the highlight of the project was the 1999 season when an actual mature Gannet was seen among the decoys over a period of about two months. This was also the first year we used the sound system on the Rock. Below are a few photos from 1999. Now I will have to write a report. Stay tuned!